A video of the shooting was shared widely online. 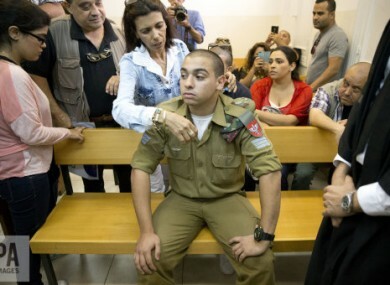 Sergeant Elor Azaria inside an Israeli military court in Tel Aviv. AN ISRAELI MILITARY court has sentenced a soldier to 18 months in prison for shooting dead an injured Palestinian assailant. Judge Maya Heller handed down the sentence a month after Elor Azaria, 21, was found guilty of manslaughter for killing Abdul Fatah al-Sharif as he lay on the ground in the southern occupied West Bank in March last year. Prosecutors had demanded a three to five year sentence but the panel of three judges decided such a punishment would be too severe. Heller said they had taken into account mitigating factors including the “harm suffered by his family” and the fact he was in “hostile territory” when the shooting occurred. She added, however, that he had not expressed remorse for his actions. The March 2016 shooting in the occupied West Bank city of Hebron was caught on video by a rights group and spread widely online. It showed Sharif, 21, lying on the ground, shot along with another Palestinian after stabbing and wounding a soldier, according to the army. Azaria then shoots him again in the head without any apparent provocation. He has already spent 10 months in detention at an Israeli military base and it was not immediately clear if today’s sentence includes time served. In January, Israeli Prime Minister Benjamin Netanyaju had said he favoured a pardon for Azaria. “This has been a hard and painful day for us all. first and foremost for Elor and his family,” Netanyahu wrote on his Facebook page. “I support giving a pardon to Elor Azaria,” he added. Email “Israeli soldier sentenced to 18 months for shooting dead injured Palestinian”. Feedback on “Israeli soldier sentenced to 18 months for shooting dead injured Palestinian”.